He, X., Xiong, X., Xie, J., Li, Y., Wei, Y., Quan, P., Mou, Q., and Li, X. (2017). "Effect of microwave pretreatment on permeability and drying properties of wood," BioRes. 12(2), 3850-3863. A microwave (MW) treatment of plantation eucalyptus (Eucalyptus urophylla) wood was investigated by applying MW treatments with varying conditions, such as radiation power, irradiation time, and initial moisture content of the wood. The wood permeability and drying properties were investigated. Results show that the permeability (both along the transverse and longitudinal directions) increased with the radiation power and the irradiation time. The permeability was considerably enhanced by the MW pretreatments, which effectively decreased the moisture content within the wood. A MW pretreatment can greatly accelerate the drying rate and shorten the wood drying time. Under atmospheric pressure the stain uptake along the transverse and longitudinal directions, with respect to the wood fibers, increased to 58% and 135%, respectively, compared to reference samples. Meanwhile, the drying rate increased to 171% and the drying time was cut by 65%. The MW pretreatment was found to generate a high-pressure internal steam that resulted in the rupture of wood cell pore membranes and ray cells. Therefore, a remarkable permeability increase and drying time reduction was achieved, which created favorable conditions for the fabrication of high value-added functional wood-based composites materials. Wood species with a low permeability are associated with many difficulties during timber manufacturing. Issues mainly come from the long and ineffective drying time, which makes the drying process expensive and energy consuming. A long drying time can also be associated with the generation of defects within the wood due to high internal stress, which introduces additional costs for recovering the sawn timber. There are extreme difficulties faced when fabricating a new wood-based composite by impregnating timber with other functional materials, such as flame retardants, preservatives, and resins. Therefore, it is essential for the timber industry to find a technology that can improve wood permeability, while reducing internal stress and minimizing drying defects. Basic factors that affect the wood permeability are the effective radius and the number of openings in the pit membrane (Bao and Lv 1992a). One effective way to improve the impregnation of wood is to increase the radius and number of pit membrane openings; this subsequently increases the flow rate and the permeability (Bao and Lv 1992b). Methods that have been used in attempts to improve the permeability of wood can be classified into four categories: physical (Demessie et al. 1995; Terziew and Daniel 2002; Kartal and Stan 2002; Rhatigan and Morrell 2003), chemical (Militz 1993; Rhatigan et al. 2004; Yildiz et al. 2010), mechanical (Richter 1989; Lehringer et al. 2009), and biological (Jacobs-Young et al. 1998; Burnes et al. 2000; Pánek and Reinprecht 2008; Yildiz et al. 2012; Pánek et al. 2013). However, until now, these methods could not effectively increase the permeability in a quick and easy way. The MW pretreatment is a relatively new method, which can be applied to improve wood permeability, and modify and reduce the internal stress during the heating of plantation wood. When the moist wood is subjected to a MW field, the electromagnetic energy is effectively absorbed by the water inside the wood, which induces its vaporization quickly. The generated water steam creates a large internal vapor pressure within wood cells (Torgovnikov and Vinden 2004). Under such a high internal vapor pressure, weaker elements within the wood structure, such as thin-walled cells and pit membranes, are ruptured to form many releasing pathways, giving rise to an easier transportation of vapor and liquids (Mekhtiev and Torgovnikov 2004). The MW heating can thus be used to increase the wood permeability (Vinden et al. 2003; Torgovnikov and Vinden 2009; Krisdianto et al. 2010; Torgovnikov and Vinden 2010; Vinden et al. 2011), improve the drying quality (Harris et al. 2008), and provide favorable conditions for the preparation of new wood-based composite materials (Li et al. 2010; Xu et al. 2014). Mechanical properties of MW-treated wood and the energy consumption during a MW treatment have been investigated. Researchers from the Co-operative Research Center in Australia (Torgovnikov and Vinden 2009; Torgovnikov and Vinden 2010) found that after a high-intensity MW pretreatment, the timber volume increased 13.4%. However, the modulus of elasticity (MOR) was reduced 12% to 17% with respect to the untreated wood. The cost for MW conditioning was evaluated from 28 AU$/m3 to 69 AU$/m3, which is acceptable to the industry and provides good commercial opportunities (Torgovnikov and Vinden 2009). Although considerable research has been devoted to MW treatments, little is known about how the treatment conditions affect the MW processing. Previous studies usually concentrate only on the effect of power density on permeability of wood. However, the effect of other factors, such as irradiation time and initial moisture content, etc., on permeability and drying characteristic of wood has not been clear, and the influence degrees of those parameters on permeability and drying characteristic is also unknown. In this study, the effects of the MW power, irradiation time, and initial moisture content on the permeability (both along the transverse and longitudinal directions) and drying characteristics of wood were investigated. Furthermore, this research provides the fundamental relation for dealing with MW treatments on wood-based composite materials. Plantation eucalyptus (Eucalyptus urophylla) was obtained from the Guangxi province, Liuzhou, China. Test specimens with dimensions of 2000 mm (longitudinal, L) × 110 mm (tangential, T) × 25 mm (radial, R) were prepared from the sapwood region of green wood. The high intensity MW pretreatment of wood was performed by a modified microwave system (MDF-N40, Synotherm Corporation, Changsha, China). The whole system was composed of a microwave applicator, waveguide transmission, material transport mechanism, MW suppressor, cooling system, and ventilation system. The device was powered by two microwave applicators with MW power of 20 Kw, respectively, and the rated power of the microwave system was 40Kw. The microstructure of reference and MW-treated wood samples were analyzed by a scanning electron microscope (SEM) (Quanta 450, FEI, Hongkong, China). Samples with dimensions of 310 mm × 110 mm × 25 mm (L × T × R) were cut sequentially from green E. urophylla. A 3-mm thick specimen was also taken for determining the initial average moisture content (MC) using the oven-dry-weight method. The sawing schematic of the test specimen is given in Fig. 1. To investigate the effect of the MW pretreatment on the wood permeability and drying characteristics, the MW power, irradiation time, and initial MC value of the wood were varied. The MW pretreatment was performed on wood dried at 40 °C until the desired MC value of 65% was reached. Four power values of 5 kW, 10 kW, 15 kW, and 20 kW were applied for 60 s. Five irradiation times were considered, 30 s, 45 s, 60 s, 75 s, and 90 s. This analysis was performed with a constant MW power and initial MC of 15 kW and 65%, respectively. When studying the effect of the initial MC of the wood on permeability and drying characteristics, the samples were dried at 40 °C to three different MC values of 25%, 45%, and 65%. 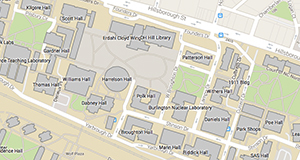 The radiation power and irradiation time were kept at constant values of 15 kW and 60 s, respectively. Four samples were used for each experiment. To prevent the moisture inside wood from evaporating quickly along the longitudinal direction, an epoxy resin was used to seal the specimens end face before the MW pretreatment. After the pretreatment, all samples were divided into two groups: one for evaluating the MW-treated wood drying characteristics and the other for permeability measurements. The specimens used for permeability measurements were processed into small specimens with dimensions of 150 mm × 20 mm × 20 mm (L × T × R) after the oven-drying at 40 °C ± 2 °C to 10% MC. Then samples were once again divided into two parts. One part had the end face of the specimens sealed using an epoxy resin, which allowed the dyeing liquor to enter in the wood only along the circular faces. The other part had the four circular faces sealed to allow the dyeing liquor to enter the wood only along the longitudinal direction. After the resin was cured, specimens were placed for 4 days (96 h) in a box (GDJS-100, Taisite Corporation, Nanjing, China) at a constant temperature (20 °C) and humidity (55%). Specimens were weighed immediately after the equilibrium treatment. In the impregnation experiment, specimens were put into the blue dyeing liquor with a concentration of 0.2% under atmospheric pressure, and weighed every 0.5 h to 1 h at first, and then every 2 h or 4 h after 3 h had passed. Each treatment was repeated six times. To evaluate the drying performance of the MW treatment, constant MC samples with the same initial weight were oven-dried at 60 °C to reach a MC of 10% to 12%. During the initial drying stage, the specimens were weighed every 0.5 h to 1 h. Then, 6 h later, the specimens were weighed every 2 h to 4 h until the end of the drying test. The edges of the specimens (approximately 2 mm) were sawed off, and the minimum and maximum thickness of the new sections were measured to calculate the shrivel depth. Then, samples were cut into three pieces along the thickness direction. The surface layer and the center layer of each sample were weighed immediately, and oven-dried at 103 °C to a constant weight. The following expression can be used to calculate the MC difference between the surface and the layer depth. The drying rate (v), the shrivel depth (∆h), and the moisture content difference between the surface and the center of the layer (∆M) were calculated using Eqs. 1, 2, and 3, respectively. where Mi and M0 are the initial and the final MC (%), respectively, t is the drying time (s), hmax and hmin are the maximum and minimum thickness of sections (mm), and Mcenter and Msurface are the MC at the center of the layer and at the surface (%), respectively. Fig. 1. 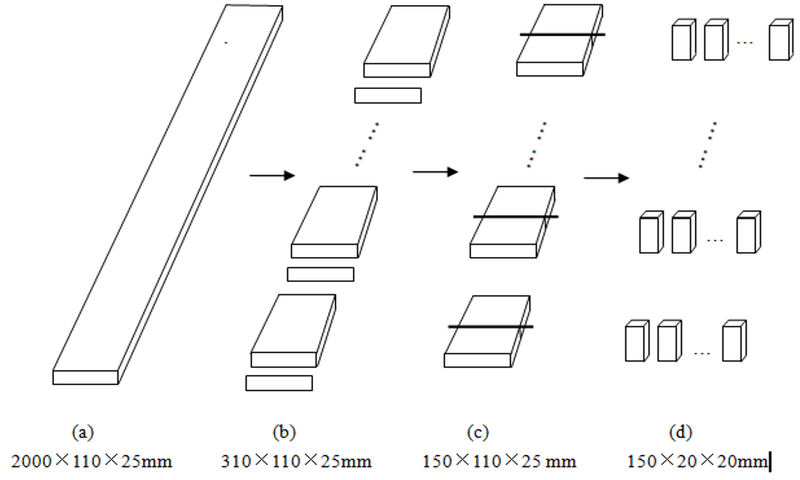 Sawing method for specimens: (a) is sawn timber; (b) for MW pretreatment and drying test; (c) is the intermediate processes of sawing; (d) for permeability measurements. Figures 2a and b show the effect of the MW irradiation time on the stain absorption along the transverse and longitudinal directions of wood under atmospheric pressure, respectively. The stain absorption along the transverse and longitudinal directions of MW-pretreated samples was much higher than that of the untreated samples. Furthermore, the stain absorption increased with the irradiation time: at 30 s irradiation, a clear dyeing uptake was observed. With respect to the untreated wood, when the irradiation time was increased from 30 s to 90 s, the weight gain percentage along the transverse and longitudinal directions increased from 0.80% to 57.5% and from 22.5% to 126%, respectively. Xu et al. (2014b) pointed that the microwave pretreatment resulted in a positive influence on the effect of the impregnation. The authors investigated the impregnation effect of microwave-pretreated poplar wood with low-molecular weight phenol formaldehyde resin, and the results show that the maximum impregnation weight gain rate was 51.08%. In this study, the stain absorption increased with the irradiation time significantly, and the ANOVA showed a significant effect with a confidence level of 95% (Table 2). This resulted from the proportionality between the irradiation time and the MW energy that was absorbed per unit of mass of wood. Thus, the moisture inside the wood vaporized quickly and the generated water steam created a large internal vapor pressure within wood cells. This led to the rupture of weaker elements of wood structures to form releasing pathways, allowing for an easier transportation of vapor and liquids, i.e. a much higher permeability (Xu et al. 2014a). Figures 2a and b show that the longitudinal permeability was more affected by the MW irradiation time with respect to the transverse direction. A reason could have been that E. urophylla had many tyloses inside vessels (Fig. 11a), which could block the channeling of water. These inclusions were easier to be destroyed when the wood was MW-treated. Therefore, the improvement of cracks produced within the wood pretreatment along the longitudinal permeability was more effective than along the transverse direction. The effect of MW radiation power on the stain absorption along the transverse and longitudinal directions of wood at atmospheric pressure are shown in Figs. 3a and b, respectively. The stain absorption along the transverse and longitudinal directions of MW-treated samples increased with the MW power. This effect was more pronounced along the longitudinal direction. This was consistent with the conclusions from the irradiation time. Compared with untreated wood, when the radiation power increased from 5 kW to 20 kW, the weight gain percentage along the transverse and longitudinal directions increased from 1.50% to 21.8% and from 5.6% to 135%, respectively. When the MW power exceeded 5 kW, the dyeing uptake of wood increased more steeply. The stain absorption increased with the MW power. This has been observed in previous studies (Torgovnikov and Vinden 2009; Torgovnikov and Vinden 2010). This was because for a larger radiation power, a higher MW energy was transferred to a unit mass of wood. Thus, the moisture inside the wood vaporized more effectively and more cracks were produced within the wood. This greatly increased the permeability of wood. Therefore, the stain absorption of wood increased with an increase in the MW radiation power. Furthermore, the stain absorption of wood in longitudinal direction was significantly impacted by the MW power at a confidence level of 95% (Table 2). Figures 4a and b show the effects of the initial MC on the stain absorption along the transverse and longitudinal directions, which gradually increased when the initial MC of wood decreased from 65% to 25%. Samples with 25% initial MC showed the higher stain absorption of 11.8 g and 5.5 g (i.e. an increase of 26% and 49%, see Table 1) along the transverse and longitudinal direction, respectively. For untreated samples, the stain absorption increased from 9.365 g to 3.67 g along the transverse and longitudinal directions, respectively. Jiang et al. (2006) pointed out that an ideal permeation effect of MW-treated wood would be achieved when the moisture content of wood is near to the fiber saturation point. These results agree with the present study. This was due to the fact that water has a high heat capacity and a high latent heat of vaporization; in the same MW radiation conditions, the MW energy may not have been sufficient to vaporize the moisture inside the high MC wood. At a high MC content, the internal structure of wood was less effectively ruptured by the steam pressure. Thus, the improvement of the permeability was not obvious. Instead, when the MC was low, each unit of mass of wood could absorb more MW energy. This caused moisture inside the wood to vaporize quickly, and the generated water steam created a large internal vapor pressure within wood cells. Under such a high internal vapor pressure, weaker elements of wood structures were easily ruptured. Therefore, the MW pretreatment could increase the permeability of wood by lowering the initial MC. 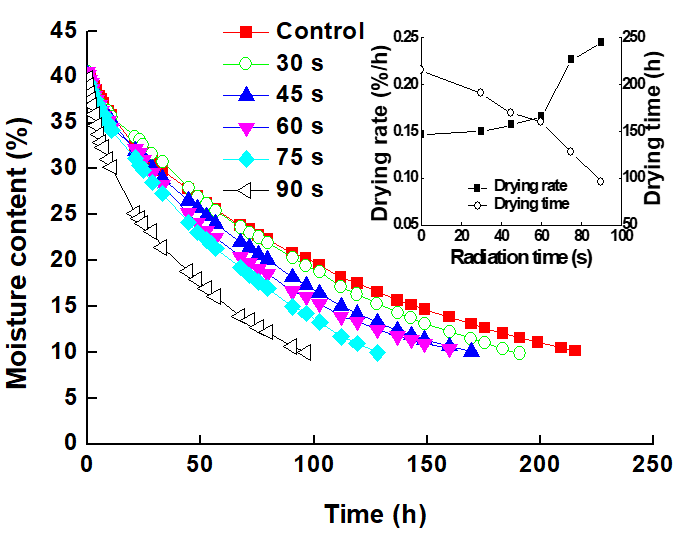 Figure 5 shows the conventional drying curves of wood pretreated with different MW radiation time. The drying time of wood decreased with increasing pretreatment radiation time, and the corresponding drying rate of wood clearly increased. For MW pretreatments from 30 s to 90 s, the drying rate increased from 0.150 %/h to 0.245 %/h and the drying time decreased from 191 h to 96.5 h. In untreated samples, the drying rate was 0.147 %/h and drying time was 215.5 h, the drying rate of MW-treated samples increased from 2% to 67%, and the drying time was reduced by 11% to 55%. The analysis illustrated the strong effect of the MW pretreatment of wood. Previous studies (Torgovnikov and Vinden 2010) found that MW modification reduces the kiln drying time of 30- to 50-mm-thick hardwood boards by approximately 50%. The explanation was similar to that used to explain the higher permeability of MW-treated wood. The longer the pretreatment irradiation time was, the more cracks that were produced. This made the water diffusion coefficient within wood increase remarkably, which enhanced the drying rate and reduced the drying time. 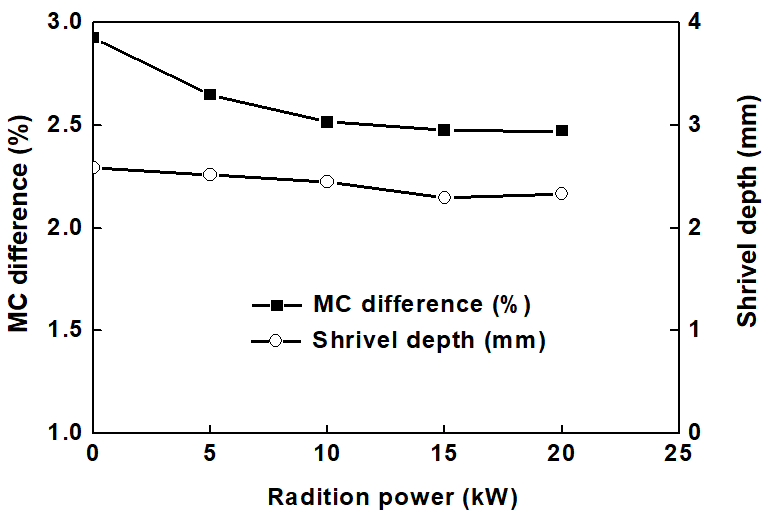 Figure 6 shows the effect of MW radiation time on the shrivel depth of wood after conventional drying and the MC variation along the thickness direction. The MC and shrivel depth were slightly reduced by the MW pretreatment. For a pretreatment time between 30 s and 90 s, the MC variation was within 2% and the shrivel depth was from 2.0 mm to 2.3 mm. In the untreated samples, the MC variation was within 2.3% and the shrivel depth was 2.3 mm. Conventional drying curves of wood pretreated with different MW radiation power are shown in Fig. 7. The drying time decreased and the drying rate increased with the radiation power. The drying rate increased sharply when the radiation power exceeded 10 kW. When the MW radiation power varied from 5 kW to 20 kW, the drying rate grew from 0.114 %/h to 0.295 %/h and the drying time was lowered from 257 h to 96.5 h. In the untreated samples, the drying rate was 0.11 %/h and the drying time was 279 h, which meant that the drying rate of MW-treated samples increased to 171% and the drying time was reduced 65%. 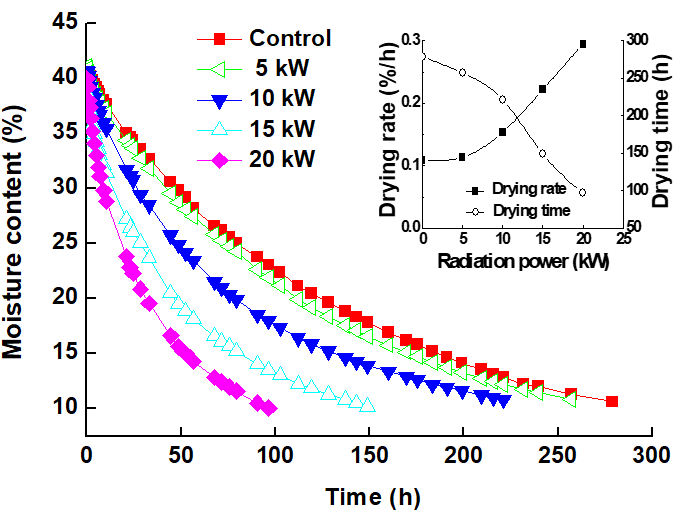 This analysis showed that MW radiation power had a strong effect on the drying rate and time. The reason was similar to the effect of MW radiation power on the permeability of wood. Figure 8 shows the effect of MW radiation power on the shrivel depth of wood during conventional drying and the MC variation along the depth direction of specimens. 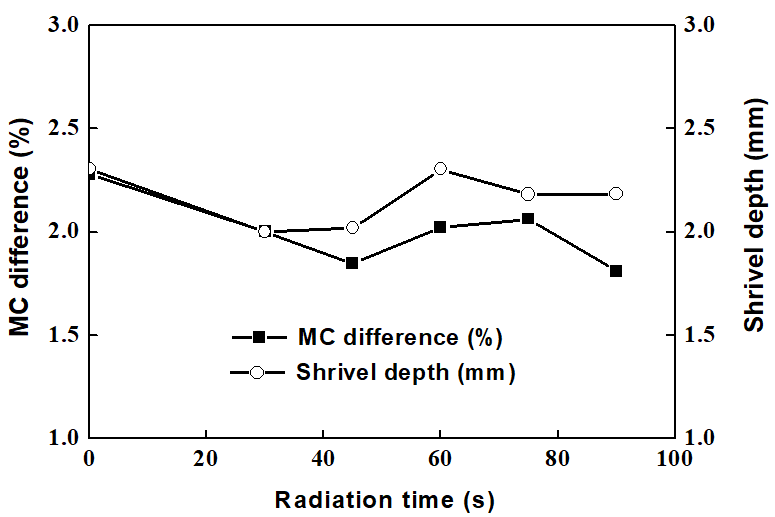 The MC variation results were slightly reduced by the MW pretreatment at different levels of radiation power and the effect on the shrivel depth was not obvious. When the MW radiation power increased from 5 kW to 20 kW, the MC variation was below 2.65% and the shrivel depth was between 2.5 mm and 2.3 mm. In untreated samples, the MC variation was 2.9% and the shrivel depth was 2.6 mm, so the effect of the MW pretreatment was not obvious. The drying curves of wood with different initial MC that were MW-pretreated in the same conditions are shown in Fig. 9. Not surprisingly, a higher initial MC was associated with a longer drying time. The MW-treated wood with an initial MC of 65% required the same drying time as untreated wood with an initial moisture content of 45%. This indicated that the MW pretreatment could effectively increase the drying rate and reduce the drying time. Due to the strong variation of the MC after the same MW treatment, the MC was adjusted to 20% to start the conventional drying with the same initial MC. However, this was too close to the final MC value of 10% to evaluate the drying rate accurately; therefore, only a qualitative analysis was performed. Figure 10 shows the initial MC’s effect on the shrivel depth during conventional drying and the MC variation along the thickness direction. The MC variation and the shrivel depth first decreased then slightly increased with the initial MC. When the initial MC was 45%, the MW-treated wood showed the lowest MC variation, which was about 30% lower compared with the untreated wood. The shrivel depth was the smallest when the initial MC of wood was 25%, corresponding to a 25% decrease with respect to the untreated wood. Microwave pretreatment not only can reduce drying time, but also can decrease the drying defects (Treu et al. 2008). The reduction in drying time for wood that is hard to dry provides a reduction in associated cost and energy, while the reduction in drying defects can increase yields and save wood to some degree. In this study, microwave pretreatment was found to greatly reduce the drying time, but there were no significant effects on the drying quality. Compere (2005) investigated the MW lumber pre-drying treatment on three different wood species. The results revealed no significant difference in quantity and sizes of checks between MW-pretreated and control samples. There are may be two possible explanations for this. One might be that the MW power was not enough, such that the drying stress inside wood could not be relieved thoroughly. The other reason might be that the overload MW power destroyed the microstructure of wood, even generating cracks on a macro-level, resulting in drying defects. Advanced research is needed for finding out the reason. The SEM micrographs of reference and MW-treated wood samples are shown in Fig. 11. The vessels and ray cells of the eucalyptus were filled with many tyloses (Fig. 11a and b). After the MW treatment, the tyloses in vessels were ruptured (Fig. 11d). The shape of the ray cells along the tangential direction of wood remained the same, but the tyloses were considerably reduced and minor cracks appeared in the middle of the lamella (see red arrows shown in Fig. 11e). Pit membranes in the radial direction of wood were seriously damaged after microwave irradiation with 15 kW for 90 s (see red arrows shown in Fig. 11f); this increased the pathways for the liquids and gases to get in or out of wood during the impregnation or drying process. In conclusion, the MW modifications in this study increased the permeability of wood up to a factor of 2.3 and the drying time was cut by 65% at most. The MW pretreatment greatly enhanced the permeability of wood along both the transverse and longitudinal directions. The wood permeability increased with the MW radiation power and irradiation time, and decreased with initial moisture content in the wood. The power of the MW radiation had a clearly higher influence on the wood permeability with respect to the irradiation time and the initial moisture content. The MW pretreatment accelerated the drying rate effectively, thus decreasing the drying time. Compared with the untreated samples, the drying rate of MW-pretreated samples increased to 171%, while the drying time was cut by 65% at most. The shrivel depth and moisture content difference between the surface and center layer of the wood were not clearly influenced by the MW pretreatment. The pretreatment generated high internal steam pressure, which resulted in the rupturing of wood cell pore membranes, ray cells, and the partial rupture of tyloses in vessels and ray cells. This was responsible for the increased permeability and the drying rate. 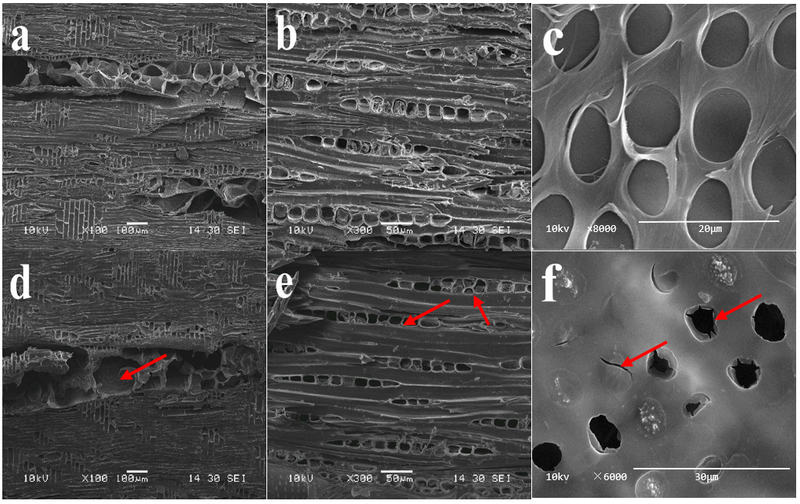 The considerable achievements in the permeability increase and the drying time reduction were favorable for the fabrication of high value-added functional wood based composites materials. The authors are grateful for the support of the National Natural Science Foundation of China (No. 31370564), graduate research and innovation projects in the Hunan Province (CX2016B344), and the Graduate Science and Technology Innovation Fund of Central South University of Forestry and Technology (CX2016A04). Bao, F. C., and Lv, J. X. (1992a). “A study on fluid permeability of important Chinese woods,” Scientia Silvae Sinicae28(3), 237-245. Compere, A. L. (2005). “High-speed microwave treatment for rapid wood drying,” Quarterly Status Report 24, 229-236. Demessie, E. S., Hassan, A., Levien, K. L., Kumar, S., and Morrell, J. J. (1995). “Supercritical carbon dioxide treatment: Effect on permeability of Douglas fir heartwood,” Wood and Fiber Science27(3), 296-300. Jacobs-Young, C. J., Venditti, R. A., and Thomas, W. J. (1998). “Effect of enzymatic pretreatment on the diffusion of sodium hydroxide in wood,” TAPPI Journal81(1), 260-266. Krisdianto, S., Vinden, P., and Torgovnikov, G. (2010). “Microwave surface modification of Pinus radiate peeler cores: Technical and cost analyses,” Forest Products Journal60(4), 346-352. Kartal, S. N, and Lebow, S. T. (2002). “Effects of incising on treatability and leachability of CCA-C-treated eastern hemlock,” Forest Products Journal 52(2). 44. Lehringer, C., Richter, K., Schwarze, F. W., and Militz, H. (2009). “A review on promising approaches for liquid permeability improvement in soft woods,” Wood Fiber Science41(4), 373-385. Li, X. J., Lu, K. Y., Lin, L. Y., and Zhou, Y. D. (2010). “Fundamental characteristics of microwave explosion pretreatment of wood I. Properties of temperature development,” Forestry Studies in China 12(1), 9-13. Militz, H. (1993). “Changes in the micro structure of sprucewood (Picea abies L. Karst) through treatment with enzyme preparations, alkali and oxalate,” Holzforschung & Holzverwertung 45(3), 50-53. Pánek, M., and Reinprecht, L. (2008). “Bio-treatment of spruce wood for improving of its permeability and soaking. Part 1: Direct treatment with the bacterium Bacillus subtilis,” Wood Research 53(2), 1-12. Pánek, M., Reinprecht, L., and Mamonova, M. (2013). “Trichoderma viride for improving spruce wood impregnability,” BioResources8(2), 1731-1746. Richter, K. (1989). “Perforation and impregnation methods to improve weather resistance of structural timber,” Empa Research and Working Report 115(19), 1-44. Rhatigan, R. G, and Morrell, J. J. (2003). “Use of through-boring to improve CCA or ACZA treatment of refractory Douglas-fir and grand fir,” Forest products journal, 53(6), 33-35. Rhatigan, R., Freitag, C., El-Kasmi, S., and Morrell J. J. (2004). “Preservative treatment of Scots pine and Norway spruce,” Forest Products Journal 54(10), 91-94. Torgovnikov, G., and Vinden, P. (2004). “New microwave technology and equipment for wood modification,” in: Proceedings of the Fourth World Congress on Microwave and Radio Frequency Application, Austin Texas, USA. Treu, A., Rieche, H., Militz, H. (2008). “Spruce and pine heartwood treatment by means of microwave radiation,” IRG document no. IRG/WP 08-40411. Vinden, P., Romero, F. J., and Torgovnikov, G. (2003). “Method for increasing the permeability of wood,” U.S. Patent No. 6,596,975. Xu, K., Wang, Y., Lv, J. X., Li, X. J., Wu, Y. Q. (2014b). “The effect of microwave pretreatment on the impregnation of poplar wood,” BioResources 10(1), 282-289. Yildiz, S., Canakci, S., Yildiz, U. C., Ozgenc, O., and Tomak, E. D. (2012). “Improving of the impregnability of refractory spruce wood by Bacillus licheniformis pretreatment,” BioResources 7 (1), 565-577. Yildiz, S., Yildiz, U., Dizman, E., Temiz, A., and Gezer, E. (2010). “The effects of pre-acid treatment on preservative retention and compression strength of refractory spruce wood impregnated with CCA and ACQ,” Wood Research 55 (3), 93-104. Article submitted: January 17, 2017; Peer review completed: March 17, 2017; Revised version received and accepted: March 23, 2017; Published: April 12, 2017.